"The issue today is the same as it has been throughout all history, whether man shall be allowed to govern himself or be ruled by a small elite." An increasing number of our fellow citizens are becoming concerned about the direction of our federal, State and local governments. Most of the attention is focused on the claims, counter claims of the Republican and Democratic Parties. Each will tell you that the other represents disaster, sometimes even when they both have the same basic position. At times it seems that our entire political process is nothing more than a grand scheme for special interests to gain influence at the expense of the citizens who pay for all of this. On many issues there is no question that special interests have more representation than the citizens. One of the reasons for this state of affairs is the virtual monopoly the two major parties have on the political process. Since the adoption of the open Primary, campaign funds have become more of a determining factor than actual performance in office. As a result we are losing our Founding Principles. More than any specific issue, the goal of the Southern Party of Georgia is to bring government back to the citizens and away from the unholy influence of special interests. Just as competition has been the cornerstone of the free enterprise system, we believe true competition should be the cornerstone of the political system. Let the people decide, not the party hacks and special interests. We are pleased to begin announcing the launch of our first major organizing efforts (See: The Southern Party: A Plan for 2006 Election Cycle). The first of which is the delivery of a 16 page newspaper (A Real Choice - image of draft on right) to all registered voter households in selected districts. Instead of the all too familiar fancy glossy tri fold brochure we want to deliver something of substance. Instead of a fancy brochure with nothing but catchy slogans, we want to provide issues, positions and information. An equal number will be distributed by other means in the hope that many of our citizens who do not participate in the elective process will become more involved. We believe that it is time for the citizens to take back control of the political process from the special interests. Even if you do not support the positions and platform of our small but growing grass roots effort we hope that you will support increasing competition in the political process so that the People, not special interests can once again begin to determine the course of our country. Competition is only avoided by those who rely on an unfair advantage, the people never benefit from a lack of competition. 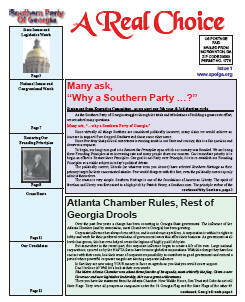 If you would like to learn more about the Southern Party of Georgia, please take a few minutes and read: Many ask, �Why a Southern Party �?� or email us your address and we will mail our latest newsletter or just give us a call. Toll free 877-903-0996 or 374-2640 in Fannin County. Part of George Washington's Farewell Address follows, concerning his warnings about the evils that could occur if political parties became too entrenched in our political environment. Help spread the word, send an announcement eCard for A Real Choice, click here.